We moved forward with W.W. I this week, and this coming week we plan to discuss trench warfare and its companion, chemical warfare. 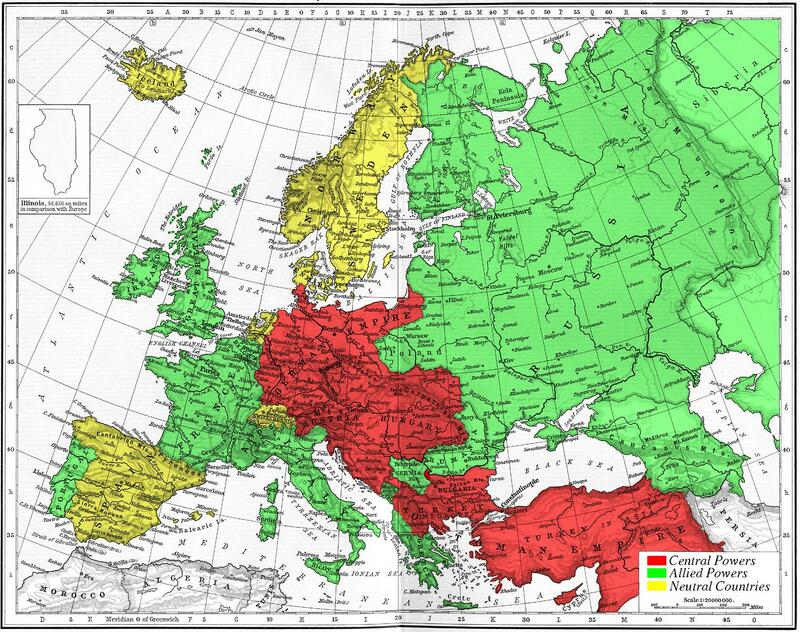 The map below shows Germany did have Turkey and Austria as allies, but both were very weak, leaving Germany to carry the overwhelming part of the burden against England, France, and Russia. They knew they could not win a long a protracted war. Trench warfare would do nothing if not slow the war down to a grind, and Germany knew that this would work against them. Germany came up with two tactics to try and tip the scales in their favor: Chemical and Submarine Warfare (we will discuss sub warfare next week). 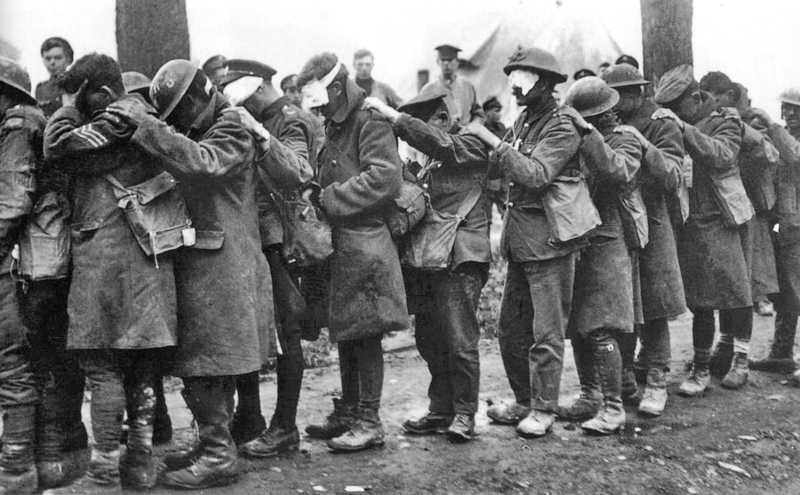 Chemical weapons were made with gas heavier than air. The idea was that the gas would sink down into the trenches, killing men and perhaps, with high enough concentrations, make the trench unlivable. This would flush them out of the trench, where they were sitting ducks. Germany knew that they could not win a long war. If they wanted victory, they believed, they needed a way to break the stalemate sooner rather than later. Mustard Gas seemed like it might do the trick. England ruled the waves, and this allowed them to continually supply their troops in France and keep their economy moving forward. Germany’s pre-war challenge to England’s naval supremacy fell short, but subs were a cheaper way to try and eliminate that lead. Immediately the allied powers regarded both kinds of weapons as unfair and unlawful. Most nations today agree that chemical weapons should be banned, but submarine warfare stuck around and became standard practice. Why do we make this distinction? Is it justified? It is a different form of killing, but it is a qualitatively different form? Does anything separate being killed by a bullet and killed by gas? Some argue that chemical weapons stay around and linger in the soil. But what about unexploded land mines? Should land mines also be banned? In fact many argue that international treaties should do just that. Sub Warfare was regarded as cowardly and ‘unsporting.’ It is also was patently ‘unfair,’ as it involved hiding from the enemy giving you an unfair advantage. Thus, in the minds of many, war became murder. By the end of World War I, the European idea of war conducted in a gentlemanly way between ‘civilized’ nations disappeared. Of course this would not be the first time in history that certain ideals about war would erode. Students who had me in the past may recall how the Peloponnesian War ended traditional ways in which the Greeks fought. Some students thought that you could not introduce chemical weapons, but could use them if someone else did. What is the basis for this distinction, and does it work? Some thought that Germany’s position of weakness justified their action, but this gets back to the question of whether or not some concept of right action or victory is most important in war. Of course poorer countries today may not like being in an inferior position militarily, and may say that current bans on chemical and biological weapons are simply a way for the rich countries to maintain their advantage. Whether the aggressor or not, Gemany’s ‘hurry up and win’ tactics hurt them strategically. Their actions against Belgian civilians helped drum up political support for the war in France and especially England. Their use of the submarine would ultimately bring in an entire new country against them, the United States. It appears that for all their tactical success and ability (all agreed that Germans made the best trenches, for example), they lacked a workable long-term vision for how to win the war. In this post I reviewed the book Just War and Christian Discipleship where author Daniel Bell makes the point that Christians need to abandon the “checklist” approach to war. This attitude reasons based on the idea that, “Because you did ‘x,’ now I can do ‘y.’ Such an approach, Bell argues, abandons the idea of war as a distinctly Christian calling, an activity like any other, designed to bring us closer to Christ. Certainly Bell, I’m sure, would argue that chemical weapons have no place in a Christian concept of war. Anyway, these questions tackle deep and profound issues that we did not have time to fully explore. However, I was very pleased at the level of student participation and the depth of the discussion.